When TV weather people talk about “humidity,” they invariably mean “relative humidity” rather than “absolute humidity.” Relative humidity is the standard used by all weather forecasters and cited by the public on hot, muggy days (“It’s not the heat, it’s the relative humidity”). But there is another measure of humidity that you don’t often hear about, and that is “absolute humidity.” Absolute humidity is far more significant than relative humidity when analyzing the effects of humidity on human health – particularly dry eye and skin symptoms caused by dry air with very low humidity. Relative humidity is a measure of air moisture relative to temperature. It is expressed as a percentage of the total volume of suspended water droplets the air is capable of holding at a given temperature. At 100% humidity, or full saturation, suspended droplets consolidate and fall out of the air as rain or dense fog. The higher the air temperature, the more suspended moisture droplets the air can hold before they start to precipitate out. ¨ At 100 degrees (F), with a relative humidity of 50%, the air is quite humid. ¨ At 40 degrees (F), with a relative humidity of 50%, the air is rather dry. ¨ At 100 degrees (F) with a relative humidity of 80%, the air is uncomfortably moist. ¨ At 15 degrees (F), with a relative humidity of 80%, the air is so dry that exposure to it may cause dehydration of the skin and eyes and even windburn. In contrast, absolute humidity measures air moisture content independent of temperature. It is expressed not as a percentage but in terms of water volume per cubic area (μl/m3 or micro-liters per cubic meter). Although absolute humidity is affected by both temperature and atmospheric pressure, the measurement does not take temperature into account and is therefore a far better indicator of dryness versus moistness. Nature’s Tears® EyeMist® is the only product that provides eyes and skin with crucial absolute humidity to alleviate dry eye symptoms. Whether the air temperature is 100 degrees or 20 degrees, the volume of moisture emitted with each application of Nature’s Tears EyeMist is unaffected, and the volume available for the eyes to absorb remains constant. 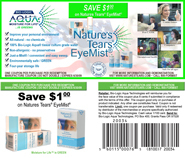 Nature’s Tears EyeMist - absolute humidity for dry eye and dry skin symptoms.